About eleven years ago I bought a lemon tree. It did nothing until recently when it produced two or three of these:- Now it is suddenly producing magnificent lemons! Strange! What kind of soil is this tree growing in??? Good old Newlands soil. I am not one to use much fertiliser, just lots of mulch. I think it may have hit a rock. Amazingly there were segments of lemon inside that lot! 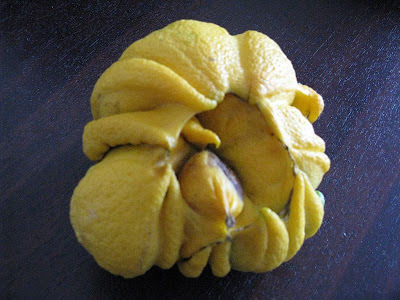 Strangely the lemons it is now producing are normal.